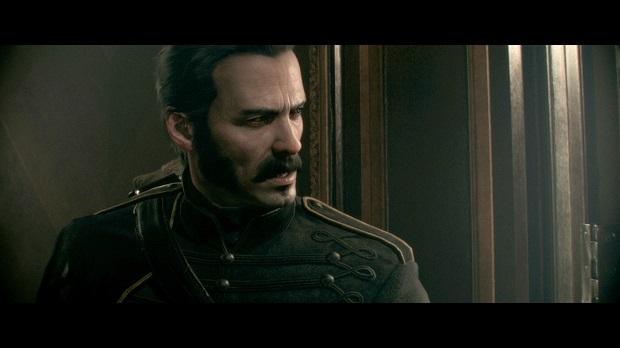 The Order: 1886 is a game with its fair share of problems. As we discussed in our spoilercast for the game, Ready at Dawn’s PlayStation 4 exclusive’s cinematic nature appears to have led to a marked lack of focus on its mechanics and gunplay that seemed at odds with the incredible polish that went into the game’s stunning visuals, incredible voice acting and score, and an intriguing world inhabited by some pretty fascinating characters. All of this centering around a conflict between King Arthur’s Knights of the Round Table and half-breeds, werewolf like creatures living among the public. One character in particular has become more retroactively fascinating to me as I reflect on my eight hour experience within The Order: 1886’s depiction of Victorian London: Grayson. Or as you’re more likely to know him, Sir Galahad. Galahad was a character that made me feel very little while playing The Order. He’s more reserved than his charming apprentice Lafayette, but not quite as personable as his estranged love interest Lady Igraine. I’ve even gone as far to imply that The Order’s more reserved protagonist was a boring character up until midway through the game. However, upon reflection, I’m feeling less indifferent to Galahad than I am fascinated by Ready at Dawn’s ability to make a character who I began to gradually feel sympathy for in the face of some pretty unlikable behavior. The Order: 1886’s opening segment was personally its most memorable for me. In it, we see Galahad being held captive and tortured by his comrades. As he begins his prison break, the player is required to make their way out crippled and less capable than they will later become. The player escapes, beaten and battered, but immediately after we are thrown back weeks in the game’s timeline. Galahad is on good terms with the rest of the order he serves, and the group is going about their half-breed killing business like any other day. As Sir Perceval, Galahad’s mentor, begins to unravel what appears to be a conspiracy between a rebellion and half-breeds, our protagonist’s loyalty to the Knights of the Round Table is tested, as his mentor’s desire to pursue evidence of rebellion activity at Whitechapel goes against direct orders from their superiors. As Galahad and his squad investigate Whitechapel, eventually leading them to infiltrating a zeppelin in order to pursue rebel forces that had boarded, it was here that I assumed Galahad would end up being branded a traitor to the order, ultimately leading up to the game’s opening sequence. But as things go wrong in Perceval’s operation, Galahad is forced to see his mentor killed in action. It’s here that Galahad is set on the path to his perceived treachery, and slowly joins the ranks of other Sony protagonists like Joel from The Last of Us and Kratos from God of War that aren’t necessarily great people, but with a motivation that makes them relatable. As The Order goes on from this point, Galahad gradually transitions from a stoic, duty-driven member of the Knights of the Round Table, to an unhinged man in mourning. The way that Galahad’s downward spiral is rolled out for the player to see is one of The Order’s strongest points. The next scene after Perceval’s death has Galahad more solemn, only to become hostile and angry after Perceval’s sacrifice is belittled by the order’s leader, the Lord Chancellor. As Galahad, fueled by the disrespect his deceased mentor, one he’s likely known for hundreds of years due to the fact that members of the Knights of the Round Table are kept alive by the Black Water they keep on them at all times, is receiving, becomes violent toward the rebellion, brash toward his comrades, The Order puts Galahad’s mourning process in focus. In the moments after Perceval’s death, Galahad has only a small conversation about the loss of his friend of likely centuries. The Order forgoes the typical discussions of death and tragedy for an opportunity to show instead of tell. Galahad doesn’t have to talk to other members about Perceval’s passing, he expresses his anguish in violent, seemingly unmerited actions toward rebels, his brothers-in-arms, and even the employees present at Whitechapel’s brothel. His behavior is extreme, damages his likability, but never comes off as unjustified because the player has seen what this man has been through and can comprehend it. The Order never gets too caught up in taking the time to explain Galahad’s change, rather it has a grasp on the fact that it should be understood. Expositioning a character’s arc in a video game can be a tricky business. Games like Watch Dogs refrain from taking the time to show players why a character is sympathetic in favor of getting a gun in their hand earlier, while The Last of Us or Heavy Rain make a point to show their protagonists’ loss and then move forward to seeing the character in question after the fact. The Order’s cinematic nature and focus on storytelling gave Ready at Dawn the opportunity to do what most games don’t: show you the middle instead of just the beginning and end of its protagonist’s transformation from respectable, to morally ambiguous. After Perceval’s death drives Galahad to continue his friend’s work, and then ultimately being framed as a traitor to the Knights of the Round Table, we find ourselves circling back to the game’s opening segment. His title as Galahad relinquished, we see a broken man who now only has one name to go by: Grayson. Still driven to stop an ongoing operation by the half-breeds to spread their ranks across the entire world, Grayson manages to track down a traitor within the Knights of the Round Table and is forced to take in the fact that the order he has dedicated his life to, that his mentor gave his life to save, was the one to blame for collusion with their sworn enemy rather than the rebellion he had his gun pointed toward for half of the game’s time. But ultimately, Grayson is basically given only one option: to disappear. Grayson is told that in order for the Knights of the Round Table to continue their noble work of defending the public from the half-breeds, he cannot reveal the fact that one of the order’s targets was hiding among their ranks for years, for fear that it will unravel the very threads that tie it together. In the game’s epilogue, Grayson stands over London and is told the city is now under martial law. He’s been pushed into hiding, and appears to have accepted that his telling the order of the conspiracy that it has been involved in will tear it apart. But even so, nothing The Order brings forward is resolved by the time the game is over, merely Grayson has been through a life-changing ordeal that exposes a greater threat outside the borders of London. As it stands, it’s an unfortunate truth that Ready at Dawn’s middlingly-received shooter was clearly designed to be Grayson’s origin story more than it was meant to be one for the game’s titular order, or the half-breeds they are in never-ending conflict with. I call it an unfortunate truth because despite Ready at Dawn’s intent on making more games in the series, given the middling to negative reaction to The Order, its cinematic focus, and the game’s short length, what the future holds for The Order as a franchise and Grayson as a character isn’t clear at this point. It stands to reason that as much time and energy that went into creating and promoting this game, the thought that Sony would cast aside a remarkable world with compelling and endearing characters as a one-off sounds pretty preposterous. But that same reception makes you wonder if Ready at Dawn is going to be walking in front of a firing squad of people ready to levy the same criticisms on a sequel that could require the studio compromise their cinematic vision. We can debate the validity of a “gameplay is all that makes a game” mindset, we can debate whether The Order goes too far in a direction of non-interactivity. But at the very least, in a game full of otherwise shallow exposition where the meat of what’s going on appears to have been saved for the sequel, Ready at Dawn conveyed one man’s downward spiral in a way that was believable, affective, and was successful in making you sympathize with a character that maybe didn’t always deserve your sympathy. The Order doesn’t need a sequel for a chance to perfect its shooting or to deliver a game twice as long. It needs a sequel because Grayson deserves justice in a game worthy of his character.